These appointments were made this morning by Lieutenant Governor Dan Patrick and are effective immediately. Committees will begin to meet as early as next week. "I am grateful to be on committees that reflect my experience and my district so well," Sen. Peter P. Flores said. "Following filing a bill, committees are where the first steps of legislative action begin. I'm honored for the opportunity and am eager to dive into the issues related to these committees. I hope to use my membership to promote conservative values for the people of Senate District 19 and Texas. "Finance Committee primarily oversees Texas' $216+ billon budget for state agencies, universities, and state services. It also reviews specialized taxes, state employee policies, and miscellaneous fees. In the history of the Senate Finance Committee, it is incredibly rare for a freshman lawmaker to be appointed––I am honored to have this opportunity. "Natural Resources & Economic Development Committee oversees legislation regarding oil and gas, environmental protection, tax systems, and economic growth. Our state is rich in oil and gas, farmland, and natural beauty; Senate District 19 is home to the Permian Basin and Eagle Ford Shale as well as 10 state parks. We must properly use and protect these natural resources. We must also preserve the climate of low regulation and low taxation that has made Texas such an economic powerhouse. "Criminal Justice Committee oversees law enforcement agencies, criminal statues, and monitoring of correctional facilities. I served 27 years as a Texas Game Warden, retiring as a Colonel. I understand well the daily sacrifice law enforcement officers make and the importance of public safety on our state. I hope to make some progress on protecting our law enforcement officers and ensuring incarcerated individuals are prepared to successfully re-enter civil society. 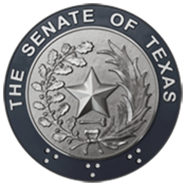 "Health & Human Services Committee oversees healthcare, physician regulations, and the administration of the largest single appropriation in the Texas biennium budget: Medicaid. Parts of my district have limited to access to healthcare––I have already identified the renovation of San Antonio State Hospital as one of my top priorities. I also hope to use my membership on this committee to fight for pro-life causes and advocate for the most defenseless of our population."